The euro-zone crisis has been widely seen, especially within the leading euro-zone creditor economy, Germany, as a sovereign debt crisis that resulted from the profligate public spending and structural weaknesses of debtor economies. This official view of the crisis grossly distorts the facts. The euro-zone crisis is better understood as a private debt crisis that arose from the liberalization of finance and from inappropriate German policies. It was only transformed into a sovereign debt crisis because of structural design flaws in the euro-zone and improvised crisis responses by euro-zone officials. This article will focus on Germany in particular, as it has been at the forefront of the euro-zone’s never-ending mess since the birth of the currency union. Not only was Germany the source of the ill-guided ideas and doctrines that shaped the design of Europe’s “Economic and Monetary Union” (EMU) but, ironically, Germany was also the very country that most starkly failed to abide by the rules of currency union, undermining its viability. As a result, Germany ended up at the heart of fateful intra-union imbalances in trade and finance, responsible for the largest net capital flows towards the euro crisis countries. When crisis erupted and spread, Germany dictated policy responses that proved counterproductive and harmful to all, even if – seemingly, at least not for now – not to itself. 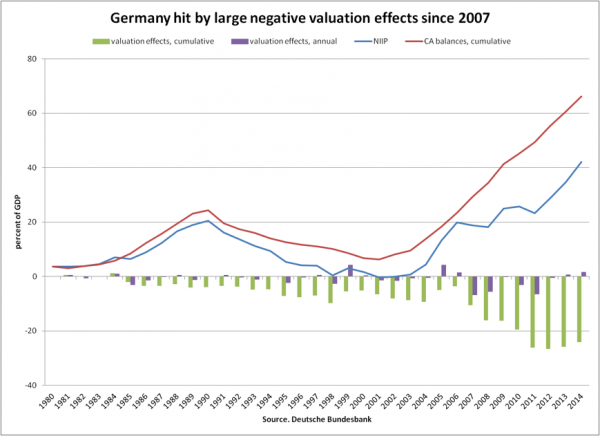 Adding insult to injury, Germany has since profited from record low (more recently: negative!) interest rates thanks to its “safe haven” status, and a euro exchange rate that is absurdly below that of what the German economy would have if it were not part of the euro-zone. Yet Germany is not actually safe in the midst of a dysfunctional currency union that is suffocating much of Europe, boosting indebtedness along the way. Excessive debt may be concentrated in euro crisis countries – but ultimately those concentrated debts are also the source of Germany’s own vulnerability as the euro-zone’s largest creditor. It makes little sense to either blame or suffocate foreign debtors to whom Germany lent so freely. Germany will have no one else but itself to blame for bringing a plague upon itself if it ends up taking massive losses from its still significant exposure to the euro-zone crisis. Financial liberalization prepared the ground for the ongoing euro-zone crisis. In Europe, the liberalization process gathered pace in the 1980s, propelled by the idea of creating a “common (financial) market” as part of Europe’s “Single Market Program” (SMP), agreed on in 1986. The SMP foresaw the complete abolishment of capital controls, establishing perfectly free capital mobility across the soon to be formed European Union by the end of 1992. Even before the end of that year, Europe came to experience its first taste of what letting capital flows “off the leash” meant: between the fall of 1992 and the summer of 1993 a series of currency crises unraveled the Exchange Rate Mechanism (ERM) of the European Monetary System, the precursor of Europe’s common currency, the euro. Causing much havoc and consternation at the time, the ERM crises of 1992-3 strengthened Europe’s resolve to push forward with the introduction of a common currency, as agreed in the Maastricht Treaty on European Union of 1991. The rush to create a common currency had dire consequences for aspiring members, who were required to adopt the treaty’s tough budgetary constraints at a time of economic weakness. In contrast to the U. S’s long boom of the 1990s, Europe went through a span of protracted stagnation and only came to enjoy a fairly brief boom towards the end of the decade. Inflation had already declined to low levels at the start of the 1990s. But Germany had demanded that euro members subscribe to price stability, which, in German opinion, required a super-independent central bank as the currency’s guardian and the prohibition of “excessive deficits” and “monetary financing”. Thus, Europe combined its zealous endeavor to liberalize private finance with a fierce commitment to contain public debt. The implicit presumption was that markets always know best while public debt can only be a threat to both the market and price stability. Be that as it may, Europe’s EMU started (with a two-year delay) in January 1999 when the euro was launched to replace the national currencies of its original eleven members. The euro literally turbo- charged capital flows across the region and beyond. Europe’s large banks, in particular, set off to foreign shores for adventurous explorations of profit opportunities. As private capital flows surged exuberantly, private debt soared and reached record levels. As we know, the private debt bonanza did not end well. The beginning of the end came when the U.S. subprime mortgage and Lehman crises hit European banks with a first heavy load of losses, triggering a process of deleveraging that continues to this day. Matters soon turned far worse when Europe’s currency union proved to be ill-equipped for shoring up the fallout of imploding regional imbalances that had been part and parcel of private debt flows in the previous decade. Facing the abyss of deflation, the euro-zone has barely regained its pre-crisis GDP level today even though it has been racking up huge external current account surpluses in recent years. Meanwhile, as a consequence of its long and still unresolved home-made crisis, the euro-zone’s public debt has surged from 60 percent of GDP at the time of the Maastricht Treaty (which set that number as a supposed ceiling) to closer to 100 percent today (see Graph 1). Without a doubt, the German-led public debt obsession paired with private debt naivety has backfired badly as it provoked a private debt boom that inevitably was followed by a financial crisis, recession , and public-financed bailouts. Financial liberalization and divergence in national wage-price inflation levels lie at the heart of the euro-zone crisis. Financial liberalization and the euro are responsible for the explosion of gross capital flows and deepening regional financial integration. Divergences in national wage-price inflation rates explain the buildup of large imbalances inside the currency union, imbalances in trade together with large net capital flows. The essence of a monetary union is a shared commitment to a common inflation rate, which at German insistence had to be low. The ECB defined the all-important commitment to price stability as area-wide inflation that is “below, but close to, 2 percent” (in line with Germany’s historical stability norm). The euro currency union represented the culmination of Europe’s post-WWII endeavor to stabilize European exchange rates and forestall any repeat of “beggar-thy-neighbor” competitive devaluations that had wreaked havoc in the 1930s. Abolishing national currencies and hence exchange rates meant that competitiveness positions would henceforth be determined by national unit-labor cost trends. Therefore, the “golden rule” of a currency union is that national unit-labor costs stay aligned with the agreed common inflation target – or risk destabilizing the union. 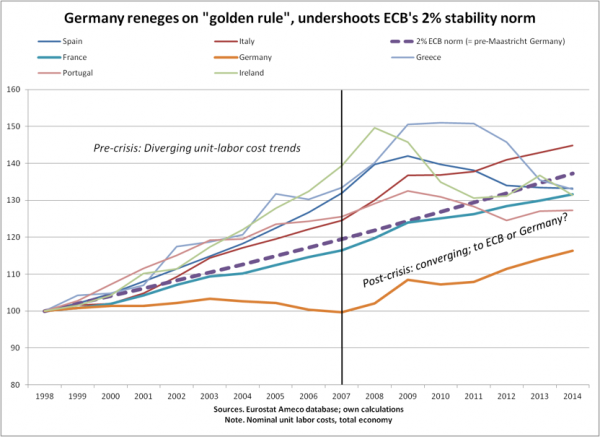 Remarkably, after boxing (parts of) Europe into a currency union of its own “stability-oriented” design and standards, Germany, of all countries, was the one to renege on this golden rule (Graph 2). Starting in the second half of the 1990s, wage repression took hold in Germany: German unit-labor cost essentially stayed flat for the ten years preceding the 2007-8 crisis. A common myth holds that Germany had to restore its competitiveness after reunification. In truth, starting from a near-balanced position, Germany ran up massive current account surpluses north of 7 percent of GDP by 2007. Prior to the global crisis, much of Germany’s trade imbalance was concentrated in Europe, about two thirds inside the currency union (see Graph 3). Looking back, Germany’s performance under the euro prior to the crisis was anything but impressive. Wage repression lastingly undermined domestic demand as Germany seemed to get stuck in perpetual austerity. Its performance was so conspicuously bad that, at the time, Germany even became dubbed the “sick man of the euro”, missing the 3-percent budget deficit (of GDP) limit for five years in a row – yet stubbornly responding with ever new austerity measures. After rising throughout the 1990s, when Germany was in a similar struggle to meet the Maastricht 3-percent budgetary mark, the public debt ratio only briefly stabilized in 2000 and then resumed its climb until 2005 (see Graph 1). Protracted stagnation depressed both German domestic business investment and inflation, and credit and financial conditions tightened domestically. The German home market had little to offer German banks in terms of business expansion and profitability. For profit and expansion German banks had to look abroad. Given that it was the largest economy in the region, German stagnation also was a brake on overall euro-zone growth. ECB policy adjusted accordingly. But since the ECB’s monetary stance is designed to suit the average, money was too tight for Germany but too easy for Germany’s non-stagnating partners. Take Spain, for instance. After going through a bout of crises in the early 1990s, Spain enjoyed a more prosperous second half of the decade, partly propelled by sharply declining interest rates, which converged to lower German levels by the time of the euro’s launch. This one-off adjustment in interest rate and asset price levels should have been largely complete but German stagnation in the 2000s then pulled interest rates even lower, enticing more lending and lifting asset prices further – into bubble territory. Unsurprisingly, wages and prices increased at above-average rates in booming Spain under the euro. Once national wage and price inflation trends diverge from the common 2-percent norm a “one-size-fits-none” monetary policy stance further amplifies these destabilizing trends. In contrast to Germany, Spain experienced easy credit and financial conditions, so that Spain’s banks surged into property lending in particular. Spain also did not labor under fiscal austerity but ran budget surpluses that were the result of booming domestic demand. 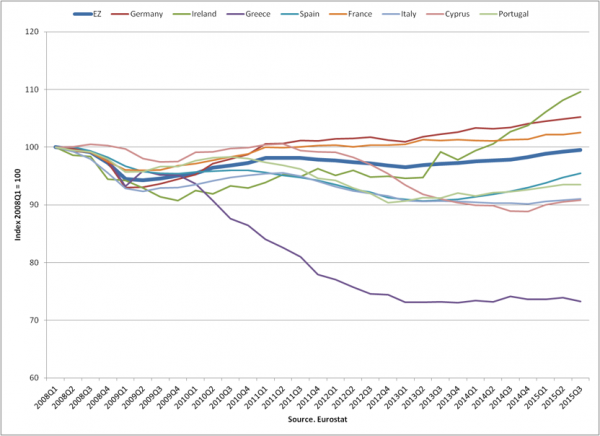 Spain’s public debt ratio actually saw a sharp decline until 2008 (see Graph 1). Far from indulging in fiscal profligacy, Spain was under the spell of a private debt binge. Diverging trends in wage-price inflation meant that intra-area competitiveness positions were out of kilter. 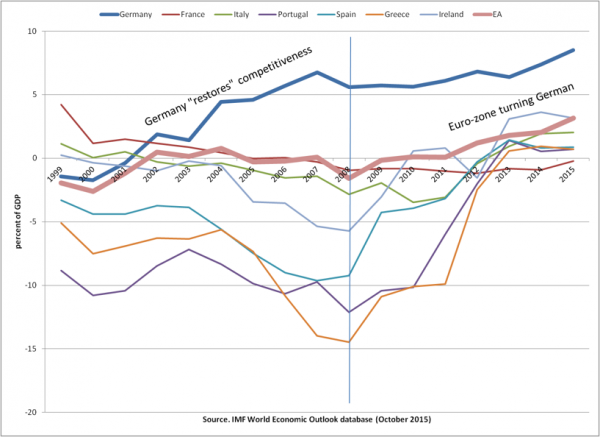 Year after year, Germany would gain competitiveness, while Spain (and almost everyone else in the euro-zone) would lose competitiveness accordingly. Furthermore, while stagnating wages and incomes in Germany held back German imports, rising employment and wages boosted Spanish imports – that is, German exports. Graph 4 shows the emergence of Germany’s ballooning current account surplus position as a percent of GDP – a mind-boggling ten-percent-of-GDP shift since the euro’s launch. Deteriorating current account positions elsewhere in the euro-zone were the mirror image of the growing German imbalance. While suffering cumulative competitiveness losses in the process, Germany’s euro partners were dragging the euro’s sick man along, which was growing on exports only. Basic accounting identities dictate that a closed economy cannot earn more than it spends and it cannot grow unless it also spends more. By contrast, an open economy can earn more than it spends by running a current account surplus. It can even grow on the back of a rising current account surplus despite stagnating domestic demand. These same identities tell us that trade imbalances have financial counterparts: financial flows that leave an imprint on balance sheets and countries’ international investment position (IIP). If the current account of a country is in surplus it accumulates more foreign assets than foreign liabilities, its net IIP improves. The opposite occurs in a country whose current account is in deficit. Graph 5 shows Germany’s IIP since the 1950s in euro billions. Starting in the late 1990s, surging capital flows lead to very fast growth of both foreign assets and liabilities (gross IIP). Starting in the early 2000s, Germany’s net IIP improved sharply driven by its rising current account surpluses. Much like its trade linkages, Germany’s financial linkages were regionally concentrated in Europe and specifically inside the currency union. To a large extent, German capital flows matched its bilateral trade imbalances. Graph 6 shows cumulated capital flows since 1991. 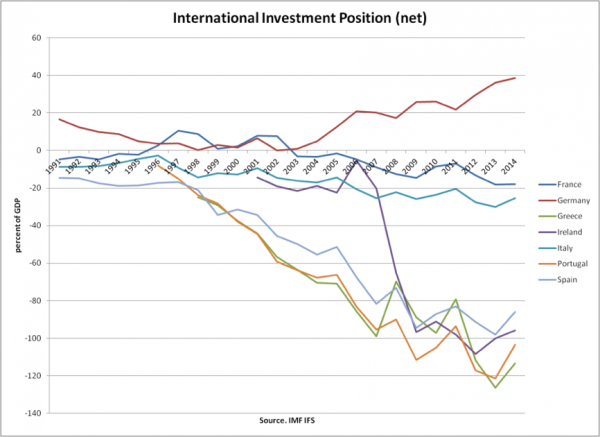 Both German capital outflows and inflows took off in the late 1990s, with an EU share of about three quarters and the U.S. making up roughly half of the remaining quarter. On a net basis, Germany’s cumulated capital flows were highly concentrated in the five euro-zone crisis countries: Greece, Ireland, Italy, Portugal and Spain (aka “PIIGS” at the time). In 2010, this estimate of Germany’s net claims against this group of countries reached almost €450bn, which amounted to roughly 90 percent of Germany’s net claims against the EU as a whole at that time (close to €500bn) and which exceeded Germany’s net claims against the U.S. of close to €400bn at the time. In other words, Germany was running up huge claims against the very countries that were also at the other end of its perpetual export surpluses (Ireland being the exception here). As financial flow data records immediate foreign counterparties in cross-border transactions rather than ultimate foreign investors/borrowers, significant distortions and discrepancies can arise, especially for portfolio investment flows. However, the results are at least indicative of the broad picture: Germany had developed massive risk exposures to euro-zone crisis countries. Ultimately, Germany’s own vulnerability originates from the same source, the very imbalances that prepared the ground for the euro-zone’s fragility and unresolved crisis. Graph 7 shows the sharp divergence in net IIPs inside the euro-zone expressed as a percent of national GDP. It confirms that, starting from zero, Germany turned itself into a large creditor country in the euro zone. A creditor needs debtors, just as debtors cannot exist without a creditor. The euro-zone’s current account position was roughly balanced (see Graph 4) and its net IIP fairly stable under the euro. Yet inside the currency union net IIPs were diverging in line with current account imbalances and net capital flows. Persistent divergences and imbalances created fault lines that could only withstand so much tension. It was all just a matter of time: intense trouble was brewing inside the currency union while the authorities were dozing off. In the end, the U.S. subprime mortgage and Lehman crises provided the external trigger for imploding intra-euro-zone imbalances. As the crisis erupted, euro-zone authorities had neither insight nor understanding of the forces at play, and lacked sufficient powers to meet the multiple challenges facing them. The first clear signs of the impending debacle emerged in the spring of 2007; in German banks were right in the center of events unfolding in the American credit market from the beginning, with Germany’s no. 1 Deutsche Bank among the key players in the global mortgage CDO market. But many of Germany’s lesser banks were involved too. Their domestic market had been flat for all too many years, so their foreign adventures had been all the more daring. Germany’s IKB Deutsche Industriebank was among the first U.S. subprime casualties in 2007. Even if it took French giant Paribas’ closing of three investment vehicles to prompt the ECB’s first opening of its liquidity floodgates on August 9, 2007, Germany’s financial sector was highly exposed to the mortgage debt crisis. The period until the Lehman failure on September 15, 2008, revealed that troubles were widespread among German banks, both private and public. Commerzbank took over Dresdner Bank, only to subsequently face mounting challenges of its own. Among public banks, Westdeutsche Landesbank (West LB) was closed while Bayrische Landesbank (Bayern LB), Sächsische Landesbank (Sachsen LB), Landesbank Baden-Württemberg, and HSH Nordbank were all bailed out. The biggest calamity of all – unfolding in the immediate aftermath of the Lehman failure – was German property lender Hypo Real Estate, primarily through its Dublin-based “Depfa” (Deutsche Pfandbriefbank) daughter, which it had purchased only in 2007. Depfa Bank had sound and safe origins in infrastructure lending to the German public sector (which shrunk under austerity in the 2000s) – until it ventured into U.S. lending products. The German government ended up with 100% ownership of Hypo Real Estate and in 2009 established a resolution agency (“FMS Wertgemeinschaft”) to handle the legacies, while another bad bank (“Erste Abwicklungsanstalt”) took over the legacies of West LB. While Germany found ways to socialize private losses incurred by German banks, the German government was adamantly resisting any (French and Dutch) initiatives for more cooperative euro-zone solutions to the wider problem, including mutual backstopping of euro-zone banks. As usual, what Germany feared the most were moral hazard and turning the euro-zone into a German-funded “transfer union”. The so-called “no bailout clause” of the Maastricht Treaty says that each member country is solely responsible for its own public debts. The virtuous should not be on the hook for the vices of their sinful partners, so went the logic. And so each country was to take care of its own banking mess – a decision that was critical in unleashing what became known as the “bank-sovereign doom-loop.” There is a mutual dependence between banks (or: banking systems) and their sovereign governments. The liquidity and solvency status of banks and their sovereigns is closely intertwined. Banks lend to governments and invest in public debt, which they also use as collateral in their funding operations. If a rating downgrade hits either party, the other is at risk too. The “doom loop” arose in the euro-zone because national treasuries became divorced from their national central banks. In the absence of any mutual banking backstop national treasuries are still on the hook for backstopping their “national” banks, but they can no longer rely on the central bank for liquidity support. In the absence of liquidity support, runs on either banks or the sovereign can quickly lead to insolvency of either or both. This dynamic is essentially what played out from 2009 on, including in economies that had initially very modest levels of public debt. 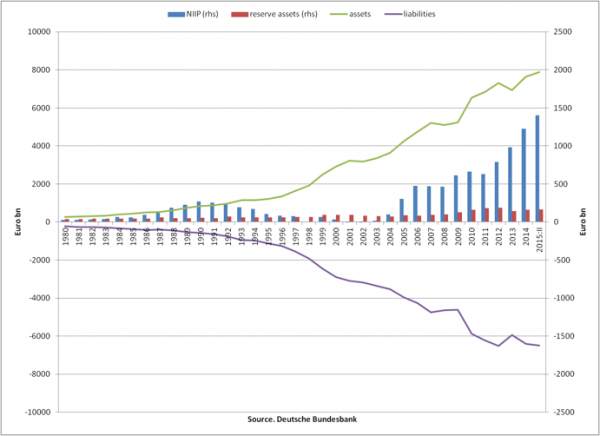 Like Spain, Ireland was another “Musterknabe” (paragon) with regard to its public finances (see Graph 1). Ireland experienced a massive property bubble, under the euro, that left huge bank losses and a deep recession in its trail. In Ireland’s case the banking system was an even bigger multiple of GDP (500%), making Ireland particularly vulnerable. Many foreign banks had Irish subsidiaries or (for tax reasons) were even headquartered in Ireland (including Germany’s Depfa). During the bubble years Ireland was also the recipient of huge portfolio and other investment (i.e. banking) inflows. In the aftermath of the Lehman failure, Ireland was the first euro-zone country to extend a blanket two-year guarantee of all bank deposits and debts of its six largest banks. Germany, and then others, followed suit shortly thereafter. Yet it was Ireland and Spain that later ended up in a “sovereign debt crisis” and needed to be “bailed out” – because of banking losses suffered in the context of property bubbles that had burst. 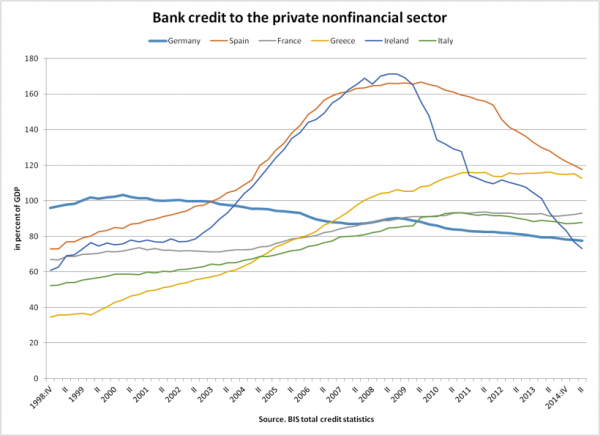 Ireland and Spain, and also Greece, had experienced vast expansions in bank credit to the private nonfinancial sector prior to the crisis. Germany stands out as the one country that saw a decline in bank credit (together with declining property prices). The Irish banking crisis was kept smoldering for years. Eventually Ireland received a bailout from the infamous “troika”—(the European Commission, ECB, and the International Monetary Fund [IMF])— in late 2010. Earlier that year, in May 2010, Greece became the first country that was “rescued” by its euro-zone partners. Not meeting the Maastricht convergence criteria at the start, Greece had joined the euro-zone as its twelfth member only in 2001. A newly-elected Greek government led by George Papandreau revealed, in the fall of 2009, that public finances bequeathed to it by the previous (conservative) government were in much worse shape than official statistics had suggested. Greek-German government bond yield spreads widened sharply. Following bouts of market panic and months of bickering and frantic political negotiations, the Eurogroup finally announced a €110 billion (three-year) bail-out on May 2, 2010. €80 billion of the first Greek bail-out package was provided via bilateral loans from euro-zone members (centrally pooled by the European Commission as the “Greek Loan Facility”) and the remaining €30 billion via an IMF stand-by arrangement (http://www.imf.org/external/pubs/ft/survey/so/2010/car050210a.htm ). Member states’ contributions were based on the ECB’s capital key, which in Germany’s case— the largest single contributor— amounted to 27 percent (or €22.3 billion) of the loans. Initially, the loans carried a variable interest rate of three-month EURIBOR (about 0.7 percent at the time) plus 300 basis points. The surcharge would rise to 400 basis points on any amounts outstanding for more than three years. In addition, there was a one-off service charge of 50 basis points. Clearly, the bail-out was not meant to let Greece off the hook cheaply. Greece had to be punished for its sins – German tabloids painted colorful pictures of lazy and profligate Greeks trying to live of hard-working Germans. The Greek crisis framed the official view of the euro-zone crisis, providing a welcome excuse for an all-out push for austerity as the euro-zone authorities came to conveniently treat the crisis of Europe’s currency union as a “sovereign debt crisis”. This was clearly the wrong description of what happened in Ireland, which finally received a €67.5 billion troika bail-out in November 2010 under rather dubious circumstances. Ireland’s sovereign troubles primarily stemmed from the bursting of its property bubble and related bank losses—most prominently, the nationalization of Anglo Irish Bank in January, 2009. Apparently, the Irish authorities had contemplated a default on senior bank debt. The euro-zone authorities, foremost among them the ECB under its French president Jean-Claude Trichet, feared that such an action would risk contagion and threaten the euro’s very existence. 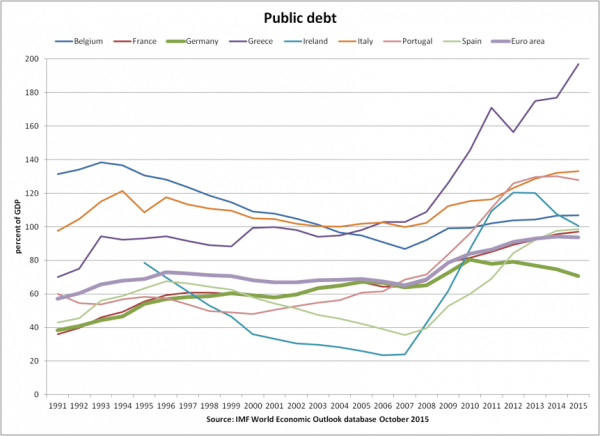 So the Irish ended up with a surge in their national public debt and troika bail-out instead. Trichet’s fears were not wholly unfounded. Market anxieties were spreading from Ireland and Greece to Portugal, Italy, Spain, and beyond (at times even threatening to infect Belgium, Austria and France – the core). Portugal received its €78 billion troika bail-out in May 2011. A little later, Greece required a second bailout of €130 billion, which brought the total up to €240 billion now extended until December 2014. Italy dodged the bullet of an official troika bail-out, the country had largely avoided a property bubble and its banks had been less adventurous internationally. It ended up under an interim (appointed rather than elected) technocrat government led by Mario Monti in late 2011 instead. Meanwhile, in Spain the property-bubble chickens were coming home to roost, with market stress escalating in the spring of 2012. The rescue of Spain’s fourth largest bank alone, Bankia, which originated from a merger of troubled regional savings banks (Cajas) a year earlier, consumed about €20 billion of public money. Government bond yields surged as bank losses threatened to overburden the Spanish sovereign, the fourth largest economy in the Eurozone (far larger than Greece, Ireland, and Portugal combined). Market speculation about an impending euro break-up was rife. In June 2012, the Eurozone authorities agreed to a €100 billion bailout package that was earmarked for recapitalizing Spain’s banking system though not providing any funds directly to troubled banks, but only indirectly through the Spanish government (specifically, the government-owned “Fondo de Reestructuración Ordenada Bancaria,” Fund for Orderly Bank Restructuring, FROB). Today, there can be little doubt that Europe’s EMU is flawed and dysfunctional. One critical flaw in the design of the euro currency union was its failure to prevent the build-up of the internal imbalances described above. The euro successfully overcame the threat of competitive currency devaluations but somehow its designers had overlooked the corresponding threat of competitive wage devaluations. Another critical flaw concerned the complete lack of proper defenses for dealing with crises. Instead of containing and resolving instabilities early on when they arose, euro-zone policy responses often aggravated the troubles and further destabilized the union. Euro-zone crisis management has consisted of little else but a patchwork of improvisations. As a result, the euro crisis still remains unresolved today as the euro-zone is struggling to reclaim its pre-crisis GDP level. Essentially, the European currency union started out as a half-way house. Already, the earlier SMP had been misguided in establishing a common European market without also creating a common European policy in parallel. This contradiction was especially hazardous for the financial system. Europe liberalized finance and pushed for the integration of its common financial market through competition, but the national authorities remained in charge of regulating and supervising financial institutions, even as those institutions ventured into extensive cross-border activities and turned themselves into Pan-European banking groups. Inevitably, the national authorities were then also called upon to manage and resolve “their” troubled institutions—only to find out that they may be lacking the powers and resources to do so effectively. The euro had made matters far worse. The arrival of the common currency had further weakened the macro policy powers of nation-states whose command had earlier been undermined by a common market that was lacking adequate common policies. Most critically, the arrival of the euro effectively divorced treasuries and central banks, fiscal and monetary policies, which were traditionally the axis of power in sovereign states. The euro-zone member states had pooled their monetary sovereignty by establishing the European Central Bank (ECB) as the guardian of the common currency but fiscal policy remained under national authorities, albeit constrained by the requirement of avoiding “excessive deficits.” A much more important constraint on national fiscal sovereignty arose from the fact that euro-zone member states are effectively issuing their debt in a foreign currency. 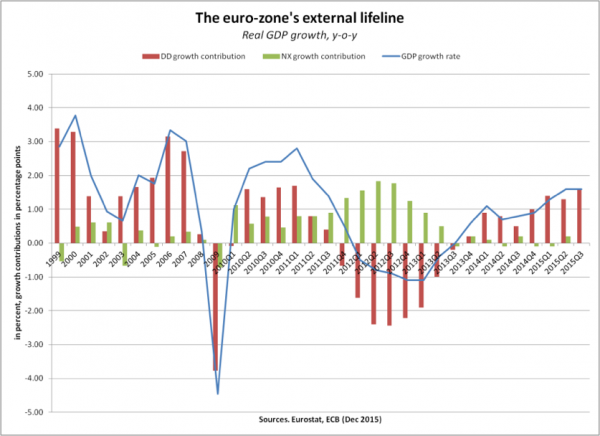 In short, euro-zone member states had lost both their monetary and their fiscal sovereignty. As a result, member states were left extremely vulnerable to systemic banking problems and abruptly deteriorating public finances. Lacking a central bank partner, the euro-zone’s national treasuries are subject to default and hence runs. Similarly, lacking a Euro Treasury partner and euro treasury debt the ECB too is vulnerable: as the euro-zone’s sole common crisis manager the euro’s supposedly independent guardian of stability became subject to diverse political pressures and legal challenges of its quasi-fiscal policies as applied to national debts. Overall, the euro-zone’s crisis response had to be improvised on the spot – often featuring national (if not nationalistic) rather than properly coordinated cooperative solutions to the common threats facing the common market and common currency. One such improvisation came with the first Greek bailout of May 2010. As noted above, the first Greek bailout featured bilateral loans between euro-zone sovereigns (as well as IMF assistance). Shocked by mounting market pressures the EU authorities also agreed to establish a mutual assistance mechanism intended to stem contagion and function as a financial safety net for the EU/euro-zone. The estimated maximum resources of the “firewall” amounted to €750 billion, including €60 billion from the European Financial Stabilization Mechanism (EFSM), an emergency funding programme guaranteed by the European Commission, €440 billion from the European Financial Stability Facility (EFSF; see here http://www.efsf.europa.eu/about/index.htm ), and a €250 billion top-up by the IMF. As a temporary fix, the EFSF was initially established as a private-sector entity in Luxembourg. It issued bonds that were backed by guarantees given by the euro-zone member states (in proportion with the ECB’s capital key). The EFSF provided the funds for the second Greek bailout in 2011 (jointly with the IMF). The EFSM and EFSF provided the funds for the Irish and Portuguese bailouts in 2011 (also jointly with the IMF). In the fall of 2012 the EFSM and EFSF were replaced by the European Stability Mechanism (ESM; see here http://www.esm.europa.eu/ ), which is a treaty-based international organization that is supposed to more permanently fulfill the role as the euro’s mutual quasi-fiscal backstop. The ESM (alone) then provided the funds for the Spanish bailout in 2012 and, jointly with the IMF, also the funds for the €10 billion Cyprian bailout in 2013. This latter crisis, too, had its origins in bank losses that exceeded the sovereign’s fiscal capacities, specifically bank losses stemming from the Greek (privately-held) public debt restructuring in 2011-2 that was part of the second Greek bailout. The troika bailout of Cyprus was the first to feature immediate “bail-in” of bondholders and depositors (beyond any losses suffered by bank shareholders). All along, the ECB was acting as monetary firefighter at numerous fronts, albeit with varying degrees of conviction and firepower. Starting with the first outbreak of money market tensions on August 9, 2007, the ECB responded by expanding its liquidity-providing programs to banks as their liquidity demands surged. In particular, the ECB eased the collateral requirements and extended the maturities of its programs. These measures culminated in two huge three-year “long-term refinancing operations” (LTROs) in late 2011 and early 2012 that saw the ECB’s balance sheet expand to a peak level of just over €3 trillion in the first half of 2012, an increase by a factor of 2.5 from pre-crisis levels. In short, the ECB was acting as “lender of last resort” to banks or, rather, banking systems. In some cases, the ECB’s liquidity support was complemented on the national level in some countries by “Emergency Liquidity Assistance” provided by national central banks (with the ECB retaining ultimate control over the magnitude of support provided in this way). Curiously, the rather fragile economic and financial climate did not stop the ECB from hiking its policy interest rates twice in the spring and summer of 2011, ill-guided moves that were reversed in late 2011. The ECB is constrained in acting as lender of last resort to sovereign governments. The “monetary financing” prohibition precludes any loans to governments or purchases of sovereign bonds in primary markets (i.e. directly from governments). The ECB may, however, purchase sovereign bonds in secondary markets for monetary policy purposes. In fact, the ECB justified its “Securities Markets Programme” (SMP) with the need to repair the broken monetary transmission mechanism. Complementing the first Greek bailout, the SMP was launched in May 2010 and at first primarily focused on Greek sovereign bonds. The ECB later widened its purchases to include Irish, Portuguese, and then also Italian and Spanish sovereign bonds. To forestall any monetary financing suspicions, the ECB fully absorbed the liquidity effect of these purchases through weekly collection of fixed-term deposits from the banks. The SMP reached a peak level of €220 billion in early 2012. The program contained but did not reverse the rise in yield spreads over the German benchmark. In Germany, the SMP prompted much public controversy and even legal challenges as well as the resignation of two German central bankers. The effectiveness of the ECB’s measures was hampered by the doom-loop, which as noted earlier has its roots in the fiscal-monetary divorce that is the euro-zone’s ultimate design flaw. Sovereign rating downgrades also hit the banks supposedly backstopped by the downgraded sovereign. In turn, any perceived bank losses also weighed on the rating of the respective sovereign. At times, the ECB’s liquidity programs succeeded in enticing the banks to purchase sovereign bonds. But more often, such purchases were based on nationality, with Spanish banks purchasing Spanish sovereign bonds, for instance, leaving banks more vulnerable to the doom-loop as sovereign risk became even more concentrated on their balance sheets. Overall, the ECB’s extensive liquidity support of banks averted widespread bank failures and a full-blown meltdown of the euro-zone’s financial system, but it did not prevent financial fragmentation and deep scars from emerging within Europe’s supposedly “common” financial market. The lack of a common safe asset and hence of a common yield curve of risk-free interest rates as benchmark was undermining the whole project as interest rate differentials surged based on the nationality of borrowers. Enjoying “safe haven” status, German interest rates fell to ever lower levels: both sovereign bond yields and yields on private bonds issued by financial and nonfinancial firms that are priced of the German benchmark. Meanwhile, private borrowers in the euro-zone “periphery” saw their financing costs surge in line with their respective sovereign’s. Market panic and frantic speculation about an impending euro breakup reached a new climax in the summer of 2012. What finally broke the vicious circle driven by destabilizing market speculation was a bold promise made by ECB president Mario Draghi in London in late July; namely, the promise “to do whatever it takes” to save the euro. For some reason, Mr. Draghi’s words managed to restore some measure of market confidence, particularly as the ECB quickly followed up by announcing its new “Outright Monetary Transactions” program (OMT). Replacing the earlier SMP the OMT too features full sterilization of the liquidity effects of any purchases. If activated, ECB sovereign bond purchases would be focused on maturities between one and three years and no ex ante quantitative limit would be set. Once again, the official rationale provided focused on the need to restore the transmission mechanism of monetary policy: specifically, the “singleness” of monetary policy. This justification officially acknowledged that both the common market and the common currency had fallen victim to financial fragmentation. In blatant contradiction to the whole idea of a common market as a level playing field and a common currency as a unifier of monetary conditions, in reality, the ECB’s monetary stance was far from single and uniform across the euro-zone. The ECB was keeping banks alive in euro-zone debtor economies through its liquidity lifelines to different degrees. 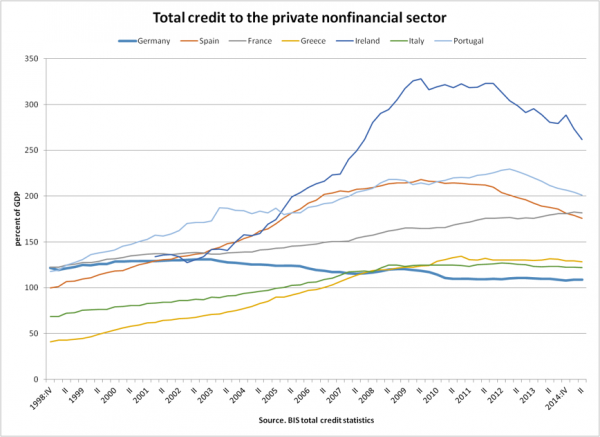 Yet, in spite of the ECB’s efforts, a severe credit crunch unfolded in the periphery nevertheless. The unfolding credit crunch combined with area-wide fiscal austerity did little good in terms of reducing debt burdens, private and public, in euro-zone debtor countries. If anything, the vulnerability of debtor economies increased further as Greece, Ireland, Portugal, Italy, Spain, and Cyprus all experienced marked GDP declines, real and nominal. As periphery debtors’ vulnerabilities rose, creditors from the core attempted to reduce their exposure to them. A creditor country can only succeed in doing so if third countries or international institutions step in in its stead. The IMF, which includes many members that are much poorer than the euro-zone, came to play a controversial role in providing an international backstop for intra-currency union fragilities among its richest members. To some extent, global investors such as U.S. hedge funds and private equity firms may have purchased euro-zone assets as these became available at fire sale prices (with initial investors from euro-zone creditor countries realizing losses in the process). However, the main feature of euro-zone crisis management entailed socializing and mutualizing the potential private losses of core country creditors within the region. This involved moving the risk of loss to both the ECB’s balance sheet and the euro’s mutual quasi-fiscal backstop (EFSM/ EFSF/ ESM). Essentially, the ECB’s emergency liquidity programs and various troika bail-outs enabled creditor country banks and investors to disengage from their financial adventures in euro-zone crisis countries while taking more limited losses. They provided fresh loans to borrowers who had become unable to borrow in markets, allowing them to repay old debts as official lenders replaced private lenders. The alternative to these measures would have been extensive debt write-downs and/or widespread defaults. By containing the losses of their banks, the creditor countries dominating the troika also contained potential bailouts of their own banks. Protecting their own taxpayers, they instead squarely burdened taxpayers in crisis countries with the legacies of the earlier reckless lending that had turned soar. Banks from the euro-zone core featured prominently in the making of the property bubbles and spending booms in the euro-zone periphery, but taxpayers in crisis countries alone were asked to pick up the bill. The bailouts were no gifts to countries in crisis – but, rather, new debts. Initially, as exemplified in the first Greek bailout, those loans were even granted at penal interest rates, which, however, soon enough turned out to be impracticable. In any case, the so-called bailouts of crisis countries complemented by ECB liquidity lifelines were primarily a means by which the creditors were doing themselves a great big favor: namely, rescuing themselves. Again, take Germany as an example, starting with the ECB’s role in socializing and partly mutualizing German private losses or exposures to such. 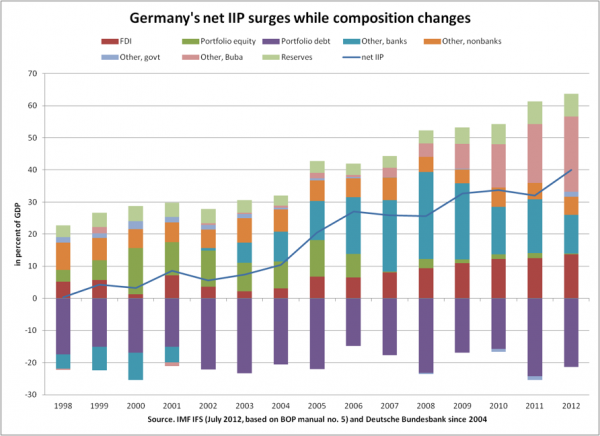 The improvement in Germany’s net IIP (discussed above) entailed important changes in composition that highlights the role of German banks. This may be best seen by using data based on the IMF’s Balance of Payments Manual no. 5, which was discontinued in 2012. Graph 9 shows for Germany’s net IIP: a portfolio debt net liability, reflecting the international role of “bunds” as safe assets, but net claims in the FDI, portfolio equity, and other investment categories ( apart from Germany’s official reserves held by the Bundesbank). It is important to note that until 2009 other investments by banks (recording cross-border loans, inter-bank lending in particular) surged, reaching a peak of close to 30 percent of GDP in late 2008 starting from a net liability in 2001. The financial flow data discussed earlier indicates that Germany built up sizeable exposures vis-à-vis the euro crisis countries in particular. Disaggregated data suggests that German banks played a prominent part in this, in sponsoring the Spanish and Irish property bubbles in particular. They did so not so much directly through cross-border mortgages but indirectly by lending to banks in Spain and Ireland thereby enabling them to fund their local property lending with great ease – until money and bank debt markets froze up in a classic “sudden stop/reversal” of capital flows. A drastic shrinkage in German banks’ other investments occurred as they retrenched from their regional and global adventures. International banks and investors, nonetheless, considered German banks as being safer than banks from other euro-zone countries and shifted their portfolios accordingly. But the more important point is that German banks’ retrenchment since 2008 was more or less fully offset by an increase in Bundesbank exposure occasioned by ECB action. Graph 9 shows a conspicuous surge in the Bundesbank’s other investment abroad – mainly consisting of its infamous TARGET2 creditor balances at the ECB. 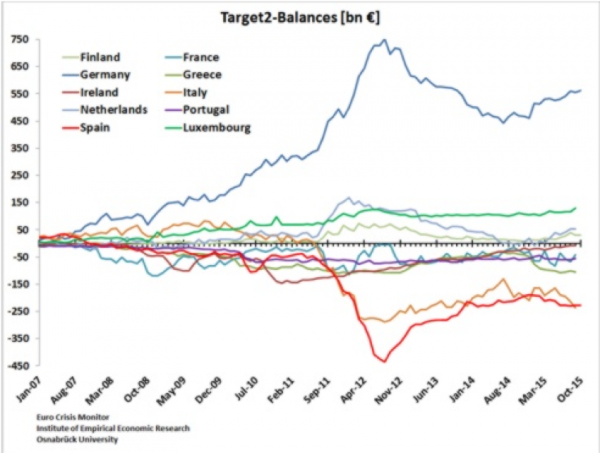 TARGET2 is the large-value payment infrastructure that connects countries’ wholesale payment systems and provides the backbone to euro-zone money markets and monetary policy. Surging TARGET2 imbalances reflect the fact that the euro interbank market shut out banks from euro crisis countries and effectively moved their positions onto the ECB’s own balance sheet as the crisis unfolded. The ECB’s emergency liquidity programs replaced market funding for banks from euro crisis countries unable to roll-over their loans from creditor country banks, with banks from Spain and Italy featuring as the ECB’s biggest clients. Because the ECB’s measures allowed these banks to repay their interbank loans, the emergency liquidity provided showed up as deposits (excess reserves) on German banks’ balance sheets­—and, hence, the Bundesbank’s as TARGET2 creditor balances at the ECB (peaking at EUR 720 billion or 27 percent of GDP in the summer and fall of 2012). Note that these are not new German exposures but simply the reincarnation of old exposures previously built up on German banks’ balance sheets. As the banks cut their exposures, the Bundesbank’s increased passively, with the ECB helping out as lender of last resort. The Bundesbank’s exposure to the ECB only turns into actual losses if at least one euro-zone member state decides to exit from the euro and defaults on its debtor balances at the ECB. The remaining members would then share those losses based on the ECB’s capital key. To the extent that such losses arose from German banks’ original lending, the mutualization of exposures on the ECB’s balance sheet would amount to organizing (German) loss sharing. Potentially, Germany could face huge losses from the Bundesbank’s TARGET2 balances in case many or all other members decided to exit and default, or alternatively, if Germany itself decided to exit. In the latter case, the losses would arise through the likely appreciation of the new deutschmark, delivering valuation losses on any euro-denominated claims. The Bundesbank’s TARGET2 creditor balances are ultimately fiscal liabilities as any realized losses on them would leave a hole in the Bundesbank’s balance sheet and impact future foreign and seigniorage income streams. In case of any euro exit and/or sovereign default, additional ECB losses (to be shared) are most likely to arise from the SMP, OMT (if it were activated), and the ECB’s own share in its more recent “Public Sector Purchase Program” (PSPP, to which we will return momentarily). Potential German public losses on the various bailout packages and joint quasi-fiscal rescue facilities established since the start of the crisis are somewhat similar in character. Actual losses will only arise in case of default or restructuring and/or euro exit of bailout recipients. Germany’s share in the joint and several guaranteed commitments backing the EFSF and the ESM is 27 percent (based on the ECB’s capital key). Given that there is little paid-in capital behind the joint rescue vehicles, ultimate liabilities due to any joint and several guaranteed borrowing on their part may become subject to re-negotiation and are therefore hard to assess. The euro authorities made sure that the Greek debt restructuring of 2011-2 (in the context of the second Greek bailout) only hit private creditors (aka “private sector involvement”). Currently Ireland owes €17.7bn to the EFSF, Portugal €26bn, and Greece €130.9bn. The average weighted maturity of these loans is around 30 years (see http://www.efsf.europa.eu/about/operations/index.htm ). At this point, the ESM has disbursed €6.3bnto Cyprus, €41.3bn to Spain, and €23bn to Greece as part of the third Greek bailout some details of which (including the IMF’s involvement) are still under negotiation. In addition, the Greek government also owes the €52.9bn to its euro-zone partners that were disbursed under the Greek Loan Facility (of bilateral loans) in May, 2010. German banks may have largely pulled out of euro crisis countries, passing the buck on to the Bundesbank, but considerable German private sector exposures to any euro exits and/or defaults remain. Especially if these were concentrated on the balance sheets of certain nonbank financial institutions, such as pensions funds and insurance companies, they could well lead to German bailouts too. Since the start of the global financial crisis, Germany has already suffered very considerable losses, both realized losses and/or valuation losses. Graph 11 compares Germany’s actual net IIP with a hypothetical net IIP based on cumulated current account balances. It shows a negative gap of nearly 25 percent of GDP (roughly €700 billion) by the end of 2014. It would appear that running perpetual current account surpluses has come at a significant cost to Germany. This is not where the collateral damages of the failed euro experiment end though. While the troika bailouts were mainly about socializing private losses and allocating taxpayer burdens, the overall damage caused in euro crisis countries and the larger euro-zone was greatly augmented by the fact that the euro-zone policy responses managed to suffocate domestic demand area-wide. The official view has it that there was no alternative to fiscal austerity and wage-price deflation. Shut out from financial markets, euro-zone crisis countries simply had to bring their fiscal house in order fast. Since exchange rate devaluation was not an option available to them, they needed to restore their competitiveness through “internal devaluation” instead. The troika “rescues” came with strings attached that administered this kind of medicine in severe dosages. Needless to say upfront debt restructuring and debt relief would have made the adjustment challenge less painful for the crisis countries. It would also have helped if the core had done more to sustain domestic demand in the euro-zone as a whole. But as a practical matter, it did virtually nothing. Germany, in particular, was in a position to borrow for free and boost its much-neglected public investment spending, for instance, but chose to fully participate in the untimely U-turn towards unconditional area-wide fiscal austerity instead. The premature all-round shift toward fiscal austerity in the euro-zone in 2010 was combined with competitive wage devaluations. It is hard to restore your competitiveness by cutting wages if everyone else is trying to do the same. It is as futile as engaging in competitive exchange rate devaluations — the folly of the 1930s Europe had sworn never to repeat. Competitive wage deflation may actually be even worse than exchange rate devaluation because it runs a greater risk of boosting income inequalities and undermining domestic demand further. Indeed, the very logic of internal devaluation requires outright deflation. Since the crisis, German unit-labor costs have risen at two percent per year. That may not sound unreasonable. But in order for the euro-zone as a whole to converge toward the the ECB’s 2-percent stability path, Germany would need to have higher wage-price inflation. In effect, Germany is forcing everyone else to adjust downward and that means that euro-zone rebalancing requires outright deflation in other countries (see Graph 2). Factor the severe credit crunch in the periphery into area-wide fiscal retrenchment and competitive wage devaluations, and it seems rather unsurprising that the euro-zone as a whole experienced eight consecutive quarters of declining domestic demand. As peripheral countries sunk deeper into crisis, unemployment skyrocketed. Policies backfired as over-indebted countries became even more over-indebted. It is clearly unwise to try to solve debt overhang problems by pushing countries into debt deflation. Italy’s banks may have avoided a full-blown property boom and bust only to attract ruin through protracted depression and deflation instead. The drawn-out crisis has magnified the problem of nonperforming loans across the euro-zone periphery. The one and only factor that prevented the euro-zone from sinking into full-blown debt deflation was global growth. Graph 12 shows that net exports acted as an external lifeline in 2010-13, providing very sizeable positive contributions to growth. In the process, the euro-zone’s current account surplus surged, approaching 4 percent of GDP (or USD 365 billion, see Graph 4 above) in 2015. In fact, the euro-zone’s external surplus amounts to 80 percent of the U.S. current account deficit in 2015. In stark conflict with the G-20 commitment to global rebalancing, the euro-zone has been the world’s chief de-stabilizer since 2010. For a few years “quantitative easing” (QE) and dollar weakness helped the U.S. to redirect the global headwinds stemming from across the Atlantic away from itself. During that time, China and the developing world at large carried the main burden of supporting the – overall tepid – global recovery. Today, these countries too are struggling under their own debt overhangs as a result. The euro-zone’s is following the German script as played out by the “sick man of the euro” of the 2000s. By turning itself into a larger Germany, one that is 80 percent the size of the U.S. economy, a very sick euro-zone is destabilizing the global economy today. Essentially, as the key member of the euro currency union, Germany is still not facing up to its “euro trilemma”. 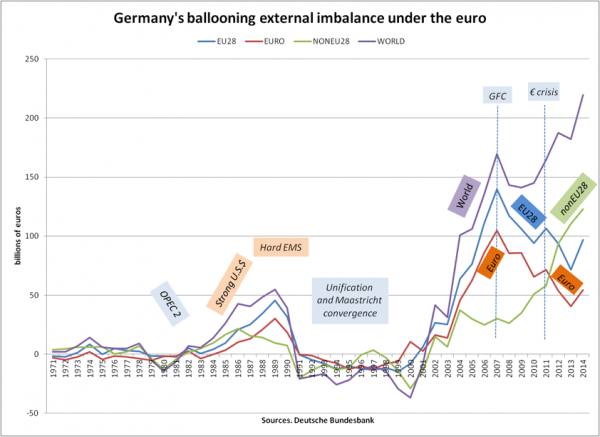 Germany simply “cannot have it all —perpetual export surpluses, a no transfer / no bailout monetary union, and a ‘clean,’ independent central bank” (Bibow, 2012, see http://www.levyinstitute.org/publications/the-euro-debt-crisis-and-germanys-euro-trilemma ). Running perpetual export surpluses will eventually ruin your trade partners, which must take on ever more debt in the process to support the creditor country’s growth. Since the summer of 2014 the ECB has belatedly decided to more aggressively counter deflationary forces – caused by competitive wage devaluations aimed at restoring competitiveness vis-à-vis Germany – that have been wreaking havoc across the euro-zone. In 2015, the ECB even launched its own version of QE, including large-scale purchases of national public debts. As a monetary policy initiative that aims to restore the “singleness” of monetary policy and help overcome financial fragmentation, the PSPP also amounts to storing away (part of) the euro crisis debt legacies on the ECB’s balance sheet. To avoid (potential) loss sharing, the greater portion of the public debt purchases is undertaken by the national central banks rather than the ECB itself, with each central bank purchasing its respective national public debt (in line with the ECB’s capital share). Apart from weakening the euro and exporting deflation to the rest of the world, these measures have shown some success in reducing long-term interest rates and in reversing financial fragmentation. In turn, reducing the interest burden on the public debt has restored some fiscal space and, starting in 2014, austerity has effectively been paused. With additional tail-winds provided by the oil price slump and euro depreciation, the euro-zone depression has finally given way to a still fragile and uneven recovery in domestic demand. Apart from the legacies of debt overhangs, as such, the euro-zone is also held back by another crisis legacy: the fiscal divide between creditor and debtor countries. The divide is visible when observing the public debt picture. While Germany has set its public debt on a declining trend since 2010, the debt ratios of France, Italy, and Spain are still rising in 2015 (see Graph 1 above). The actual divide spans both public and private debt. Graph 13 once again shows that Germany is the odd man out, with total credit to the private nonfinancial sector (households and nonprofits serving households as well as nonfinancial corporations) declining, while rising everywhere else, at least until recently. The decline in private sector indebtedness in more recent times was offset by a faster rise in public debt in these countries. This divergence in national debt trends, both public and private, is the mirror image of the divergence in net IIPs noted earlier (Graph 6). An economy that runs a current account deficit and takes on more foreign debts will have at least one sector that actually does the borrowing. In all these economies (other than Germany) it was the private sector that took on more debt. This is even true for Greece, which was more or less unique in experiencing growing public indebtedness at the same time. By contrast, Germany balances its public budget by running an 8-percent-of-GDP external surplus, which means that Germany’s private sector acquires assets and (net) foreign claims in precisely that order per year. In other words, Germany continues to rely on foreigners taking on extra debt to sustain the German model. A greater share of that extra debt now originates from outside the euro-zone, but Germany’s euro partners, especially the euro crisis countries, remain saddled with their debt overhangs. Debt overhangs and the creditor-debtor divide provide important obstacles to a more robust recovery in euro-zone growth today. The fact that Greece needed a third bailout in the summer of 2015 (see http://ec.europa.eu/economy_finance/assistance_eu_ms/greek_loan_facility/ ) is really only the tip of the iceberg. Bear in mind that Greece is today more than 25 percent poorer than prior to the crisis. 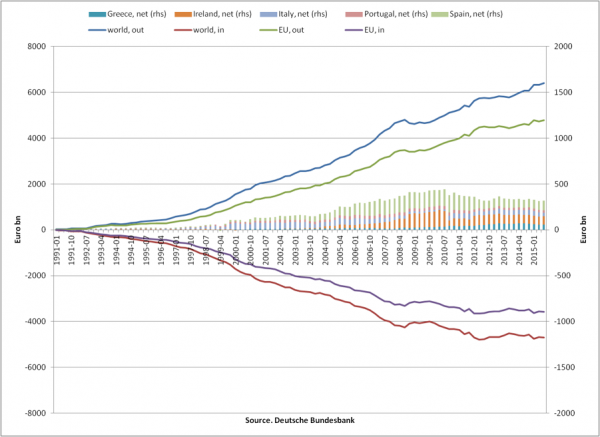 Italy and Cyprus are still about 10 percent poorer today than in 2008. For Spain and Portugal, the loss in income stands at roughly 5 percent today. The euro crisis has left these countries poorer and saddled them with a lot more debt – debts on which they still pay significantly higher interest rates than do German borrowers. In short, the euro has created few real winners and left Europe deeply divided. While GDP may reclaim its pre-crisis peak by the end of 2015 (Graph 14), the level of domestic demand remains almost 4 percent lower than that (matching the size of the current account surplus; Graph 4). Rather than providing the means to joint prosperity in Europe, the euro and liberalized finance have proved to be powerful tools for impoverishing and dividing the continent anew. In this context, the ECB’s recent measures to reduce area-wide interest rates to very low (or even negative) levels provides some welcome relief to debtors, both public and private. Germany now “pays” negative yields on its public debt at maturities up to seven years. This is an important boon to the public budget – but far less popular with private savers. Implicitly this policy also accomplishes some degree of redistribution between creditor and debtor countries within the euro-zone. Today, German tabloids are complaining that the ECB imposes a “penalty interest rate” on German savers, who are no longer getting rewarded for their good deeds (i.e. saving). Germany was the source of the ill-guided ideas and doctrines that shaped the design of the euro regime, only to then fail to abide by the rules of currency union. As a result, Germany has found itself at the center of grave intra-union imbalances in trade and finance. As these unraveled, Germany dictated policy responses that have proved counterproductive and very costly for the euro-zone as a whole. Today, deep divisions appear to prevent cooperative solutions to making the euro viable. It is unsafe to assume that the euro will still exist in ten or even five years’ time. Ultimately, Germany too will pay a steep price if the euro fails – for which Germany would have no one else to blame but itself. At first the euro existed only in electronic form as the issuance of euro banknotes only followed in 2002. While the national currency banknotes remained legal tender until 2002, the euro demoted the status of the national currencies to that of mere sub-units of the euro already in 1999 when the European Central Bank took on the responsibility of managing the common currency. The European Commission (2012, p. 40) reported large valuation losses for Germany from the second half of 2007 through to 2011, observing that (by 2011) “the largest part of these losses had already been realized in 2007-08, as a result of the implosion of the U.S. subprime mortgage debt market … Germany was among the hardest hit due to its very high holdings of [asset-backed commercial paper]”.